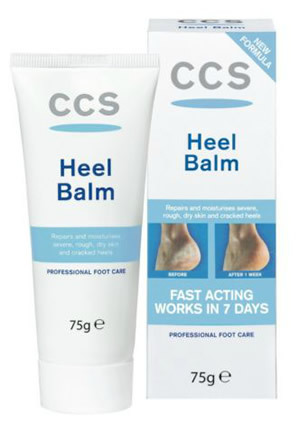 CCS Heel Balm is a wonderful product for difficult and severe cases of rough, dry and cracked heels. It is fast acting and effective. The heel balm contains vitamin E, an anti-oxidant, and urea, the body's natural moisturiser. The heel balm exfoilates the skin, balances the texture of the skin, and protects it with a non-greasy barrier. It is lanolin free, dermatologically tested and contains vitamin E to soften the skin. Apply twice daily to dry skin for 7 days and then use the ordinary CCS foot care cream. Apply at night and use socks for best results.